Even some of the most iconic and talented actors and actresses that have gained a big reputation in Hollywood can make a few bloopers sometimes, especially when you see minion-like creatures jump around on set! 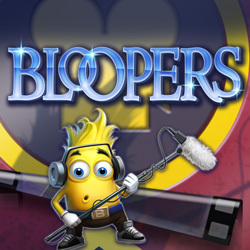 Created by the people behind Elk Studio, Bloopers gives all of its players the sensation of what it's like to be in front of the camera, and fill up their wallets with a big wad of winnings at the same time. When you appear on set after you've loaded up the game on the screen, you may find yourself wanting to take acting classes once you've finished playing it! If there's anything that Elk Studios is known for, it would be the amount of intense graphics, high quality entertainment, and massive payouts that it delivers to all of the players the take part in their games. They may have only been established since 2012, but they have already gained a high reputation amongst many suppliers within the casino industry. And they don't restrict you from making big winnings from a computer, as they make all of their games accessible from mobile devices like tablets and smartphones. Some of their other prolific games like Tao Brothers, Electric Sam, and Champion's Goal have gained positive reviews from avid online gamers. So, you can be sure that you won't be left disappointed with Bloopers! If you've always wanted to know what working on set is like in the Mecca of blockbuster films, then this is your chance. Behind your 5x3 reels, you'll get a glimpse of Hollywood in CGI format, and the reels themselves look like strips of film which adds to the theme of the game. Some of the base symbols that you will need to make matching combinations on come in the form of the minion-like creatures that I've mentioned before, which all take the role of certain crew members like sound engineers, film cutters, and stuntmen. Backstage Staff WILD: This symbol replaces some of the base symbols on the reels to help you get the combos that you need to make your winnings. They also act as multipliers when they appear on the reels. Hollywood Star SCATTER: If you get this icon the reels, it will trigger a bonus round and award you with extra credits. Bonus Round: You'll be taken to a director's cut board where your winnings will be amplified when you get a bunch of combos on this spin. You cannot help but praise Elk Studios for developing another fantastic game that many avid casino players, such as yourself, would get addicted to. And who couldn't get addicted to the thrilling life that many actors and actresses have in Hollywood, not to mention the magic that goes on behind a film set! If you're eager to feel like a star and make a lot of winnings, play this online slot game by Elk Studios the moment you have some free time on your hands!